Each year, boaters in festive spirits spend time and money to decorate and show off their vessels, entering holiday boat parades throughout Southern California. The twinkling lights, holiday music and themed decorations on boats and waterfront homes attract thousands of spectators to the harbors each holiday season, looking to view the final results of what boaters and parade organizers have taken months to plan. Here is an updated list of boat parade award winners from harbors throughout Southern California. Additional local event winners will be announced in coming weeks. Hi Tech Christmas Charm: Greg and Loretta Zimmerman, 327 Sapphire. 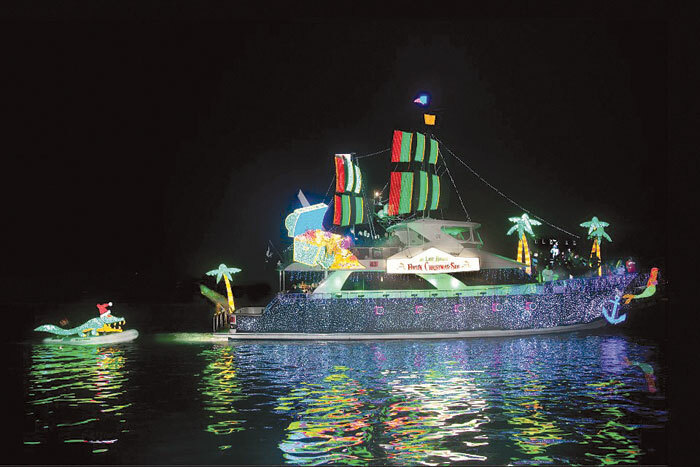 Ave.
Best Lighting: Hydro Therapy, Skipper: Bruce Honer, Theme: Happy Holidays … No, It’s Merry Christmas, Stupid!